Cristian Mungiu: Metaphor Or Not, 'Hills' Has Eyes For Romania's Past Already the poster child for his country's so-called New Wave of filmmakers, the director takes another realistic dive into the post-Communist Eastern Bloc with Beyond the Hills. Though he hesitates to call it a straight metaphor, the symbolism of the film is uncanny. 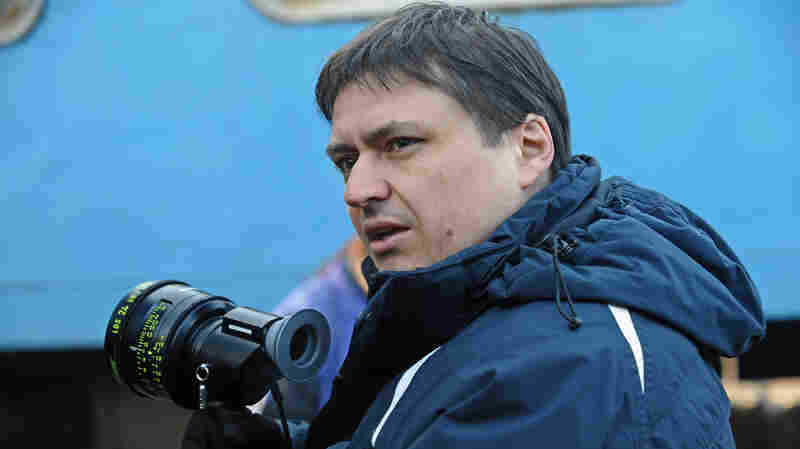 Cristian Mungiu became the poster boy for the Romanian New Wave when his film 4 Months, 3 Weeks and 2 Days took the top prize at the Cannes International Film Festival in 2007. Like that film, Mungiu's latest turns an unblinking camera on two troubled young women in a dysfunctional society. Beyond the Hills is now opening in theaters across the U.S.
Like its predecessor, Beyond the Hills was a prizewinner at Cannes: Its two young stars shared the best actress prize last year, and Mungiu won best screenplay. The story he tells is disturbing. "The film is inspired by a couple of nonfiction novels written by Tatiana Niculescu, which documented what happened in 2005 in this monastery," Mungui says. "But the film is not trying to have any kind of police investigation and documentation of what happened." What happened, in the end, was an exorcism. The film begins when a young woman comes to visit her friend, with whom she'd grown up in one of Romania's infamous Ceaucescu-era orphanages. "There's a very strong relationship which is being established between children that go together in an orphanage because they have to defend themselves against the aggression of the others," Mungiu says. One of these girls, Alina, has moved to Germany to work. Her friend, Voichita, has been accepted into a monastery and plans to become a nun. Alina can't accept that the two once-interdependent orphans have grown apart. And when she visits the monastery, she falls apart. The monk and some nuns rush her to a hospital. The doctor can't figure her out, so he keeps her a few days, prescribes medicine and returns her to the monastery. "He sends her back ... telling them, 'You know, they might as well pray for her because this helps,' " Mungiu says. The monk and nuns try, but things only get worse. "They are good-hearted, they try to do something," Mungiu explains. "But they are clueless, they don't understand. There's a limit of understanding which is associated with their way of life. But honestly, there is the same limit about the doctors that interfered in this case. "You wonder if there's a great difference between their attitudes and between believing that this girl is being possessed by some evil forces. It's very difficult at the end of this story to just point out who is the guilty party and to which degree. Because everybody is guilty, in a sense." 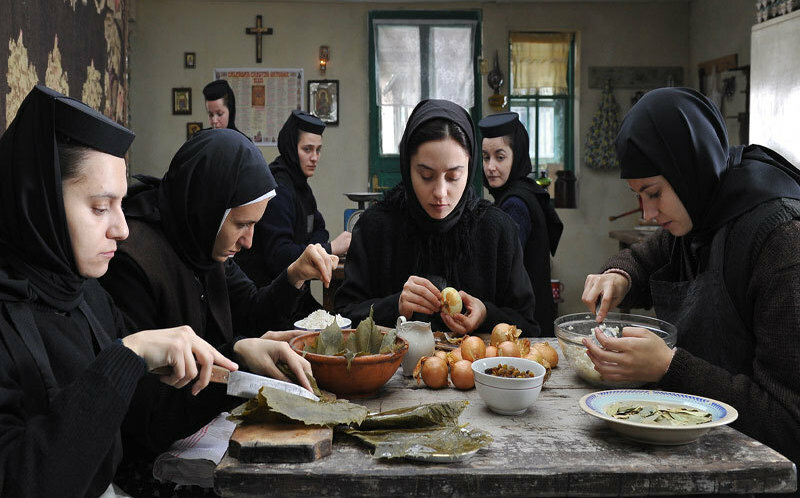 A group of nuns shares a meal in Beyond the Hills. Though the director is hesitant to underline metaphors in his film, contemporary observers won't find it hard to discover what seems like suggestive references to the Romania of dictator Nicolai Ceaucescu. There's a complex background to what Mungiu says. Mona Nicoara, a Romanian documentary filmmaker working in New York, says the two young women in the film are emblematic of the abortion and birth-control policies of Romania's former dictator Nicolae Ceaucescu. Thousands of unwanted children were dumped into orphanages that were ill-prepared to care for them. Alina and Voichita are members of what's called a "lost generation of orphans." "Romanian society has broken down, at least in this film, to such an extent that somebody with no support — somebody who comes from an orphanage, somebody who does not have very many friends in the world, except for one good friend at a monastery — cannot find their place easily," Nicoara explains. "And [she] can very easily fall between the cracks [of] this very, very loosely knit net of support. "And it attacks just as much the mental health care system; it attacks [that] just as much as other institutions. It gives very little faith in the police or in the justice system. So I think it is not so much a comment on history as it is a comment on what we've made of the present." But writer-director Mungiu says his film is neither a tract on social conditions nor a metaphor for something other than what he shows onscreen. He says he tried to keep Beyond the Hills as close to reality as possible. That's how it takes on wider meaning. "There are a lot of layers," Mungiu offers. "The film speaks about a lot of things on a personal level, on a human level, and about society in general. But I'm not trying to have them clearly expressed in words and introduced in the story from the beginning. "The way I work is different. I believe that if I focus, if we focus when we work — I mean me and the actors — [on] each moment, to make it very, very close to life, very believable as a moment in itself, the story in general is going to have a lot of senses. I'm never trying to give, like, a very precise sense to something that would mean something else." Mungiu may not believe in metaphor, but after all the despair and tumult in the story, a character sitting in a police van stalled by traffic, construction and weather asks, "When is this winter going to end?"